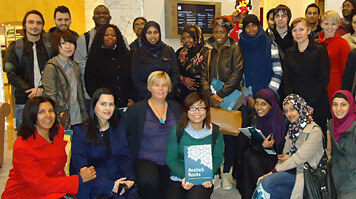 As part of their "Social Aspects of Science" module, the final year group from the Dept of Applied Sciences, accompanied by module coordinator Dr Anne-Maria Brennan, had a personal guided tour of the Britain's academy of science. In addition to seeing the Royal Society's meeting rooms, the group viewed archives detailing the lives and careers of early Fellows. The students explored records and artefacts that revealed that a significant number of the early Fellows were from North Africa. These well-travelled scholars forged international links with the scientific community of their time proving that international collaboration between scientists is a far from recent phenomenon. The visit was particularly timely as it took place in Black History Month and also coincided with the Royal Society's highly acclaimed "Arabick Roots" exhibition. This gave the group a chance to marvel at and celebrate the historic diversity within the world's oldest scientific society.